Flax, with the binomial name Linum privatissimum, is a member of the genus Linum in the family Linaceae. It is a food and fibre crop that is grown in cooler regions of the world. The oil is known as linseed oil. The plant species is known only as a cultivated plant. They’re tiny nutty-flavoured seeds that not only taste good but have innumerable health benefits. Here on these page we will see some of the important health benefits of flaxseeds. It’s oil, used as a nutritional supplement, and as an ingredient in many wood finishing products. Flax is also grown as an ornamental plant in gardens. Flax fibers are used to make linen. Omega-3 are polyunsaturated fatty acids, considered as essential nutrients that our body can’t produce but needs to maintain good brain health and cognitive function. Lignans are naturally occurring forms of the female hormone estrogen and antioxidant qualities are found in certain foods. Mucilage helps assures a healthy intestine and proper absorption of nutrients. Flaxseed contains both the soluble and insoluble types. Preliminary research also suggests that daily intake of the lignans in flaxseed may modestly improve blood sugar. Magnesium is an essential nutrient that helps regulate blood sugar levels. When blood sugar levels are under control and not spiking up and down, it is easier to lose weight and decrease fat storage. Health Benefits of Flaxseeds: It can also help women with irregular periods and those with extreme symptoms of PMS – for example, headache, anxiety, mood swings etc. They also help in controlling heavy bleeding during menstruation, reduce the risk of breast cancer and improve uterine function. They can help reduce menopausal symptoms, such as flushing and night sweats. 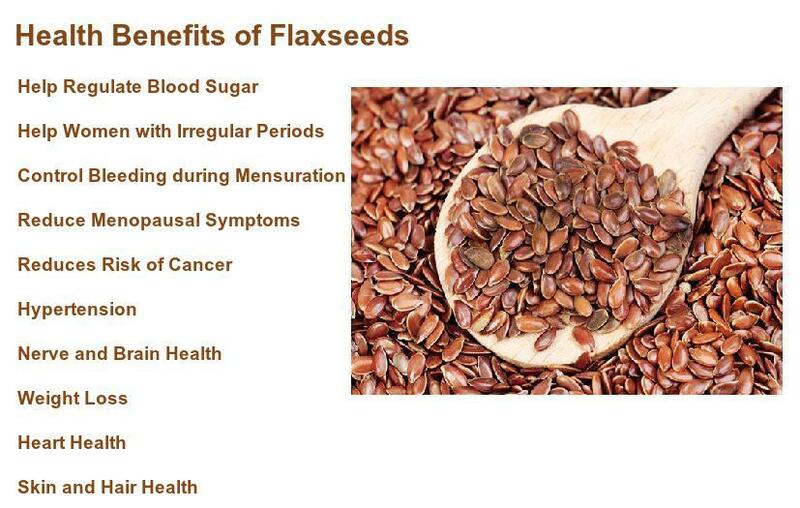 Health Benefits of Flaxseeds: It has a nutty flavor, also is rich in fiber and lignan, an antioxidant that’s been shown to protect against breast cancer. Some call it one of the most powerful plant foods on the planet. It may help reduce your risk of heart disease, cancer, stroke, and diabetes. Recent studies have suggested that flaxseed may have a protective effect against breast cancer, prostate cancer, and colon cancer. Flaxseed oil consumption resulted in significantly lowered blood pressure readings. Consider adding flaxseed oil to your diet and you may be saving yourself literally from the headaches associated with hypertension. The fatty acids help to keep the brain and it’s plumbing healthy. Nerves stay covered with a nice layer of fat, which makes for a happy nervous system. Health benefits of flaxseeds in Weight Loss. Flaxseeds have great oxidative abilities to help increase metabolism. With a proper, well-balanced nutrition and workout program weight will come off easier. Just like the plumbing of the nervous system, flaxseed also helps the cardiovascular system. It acts to thin the blood to prevent clotting and helps cholesterol. Research shows that due to its low- saturated fat content, and its high polyunsaturated fat. Flax is helpful at slowing LDL (bad) cholesterol while having minimal effect on the HDL (good) cholesterol. Omega-6 is linked to increased hair growth and maintenance. As well as skin and bone health.